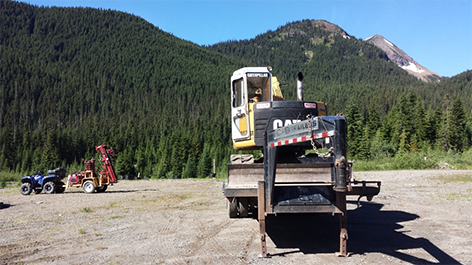 Vancouver, British Columbia – July 31, 2018 – New Destiny Mining Corp. (TSXV: NED), (the “Company” or “NED”) is pleased to announce it has commenced the 2018 trenching program on the Treasure Mountain Silver, Precious – Base Metals, Property in southern British Columbia. The trenching program is being conducted in the southeast region of the property. Till geochemical sampling during 2016 utilizing an auger drill identified gold and copper anomalies (up to 0.055 ppm gold and 132 ppm copper) in this region of the property. One of the till samples also returned anomalous values for lead (347 ppm Pb) and silver (2 ppm Ag). The Company has received a permit from the British Columbia government to conduct trenching and diamond drilling in this region. The program will consist of a series of trenches with the objective of locating the bedrock source of the till anomalies. Diamond drill pads will also be constructed during the current work program. A British Columbia MINFILE occurrence referred to as Rio Grande is reported 1 to 2 kilometers north-northwest of the 2016 till anomalies and area of current trenching. The Rio Grande occurrence is reported as a lead, zinc and silver bearing shear zone. Two copper and molybdenum MINFILE occurrences are also reported in the southeast region of the property, northwest of the area of current trenching. Spokane (northeast region near Jim Kelly creek): A sample reported in 1913 of 4.11 grams per tonne (g/t) gold over 0.9 meters across the zone. 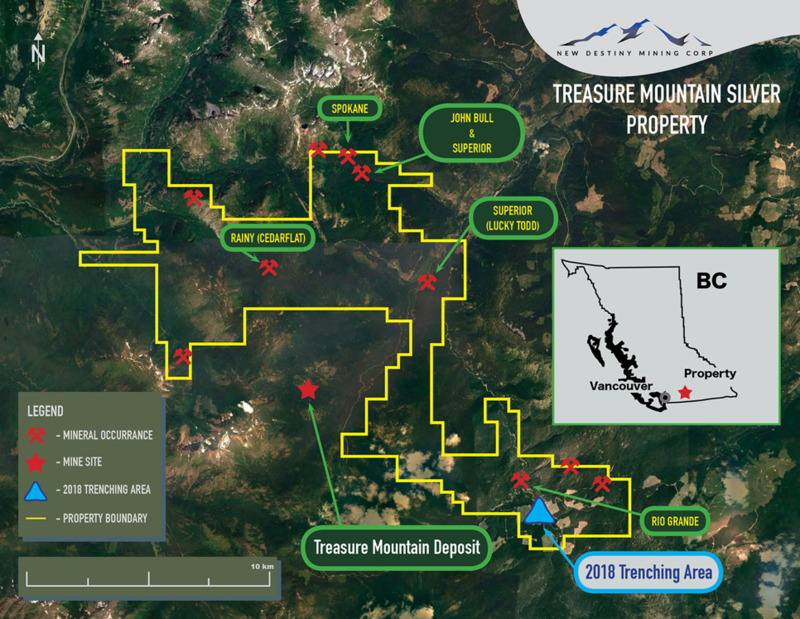 Previous 2018 summer work by the Company within the Treasure Mountain Silver Property included rock geochemical sampling in the northeast region of the property. Sample highlights included 11.3 and 8.81 g/t gold in grab samples at the northern Superior occurrence (Jim Kelly Creek area) and Superior (Lucky Rodd) occurrence (News Release of July 26, 2018).